Patient transport volunteers provide a valued and greatly needed service transporting patients to and from the hospital. 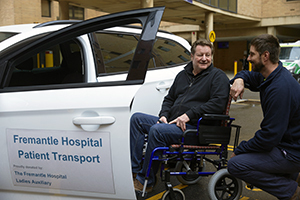 Our volunteer drivers drive modern well-equipped cars funded by the Fremantle Hospital and Health Serice Ladies Auxiliary. On average, our drivers volunteer for one eight-hour shift per week. Arrangements with our volunteer drivers are flexible.